Unlike conventional KAFOs, stance control KAFOs allow for free knee flexion during swing phase while also providing knee stability in stance phase through an automatic locking mechanism. Traditional KAFOs only lock in full extension, which provides lower limb stability, but also causes patients to ambulate with gait deviations that may lead to other problems over time. Since traditional KAFOs do not allow for knee flexion while the patient is ambulating, they also require more energy to use. Stance control orthoses (SCOs) on the other hand, allow the patients knee to flex during the swing phase of gait and block flexion in stance phase for stability. An SCO’s ability to provide knee flexion during swing phase allows patients to walk with less effort and a more symmetrical gait pattern. The Stride Family consists of a versatile group of interchangeable stance control orthotic knee joint systems known as the FullStride™, SafetyStride™ and Stride4™. All three systems are mechanical in nature and utilize a low-profile cabling system to automatically unlock at the end of stance phase. At the end of swing phase, the locking mechanism re-engages to provide knee stability for stance phase. Each Stride component group provides specific and unique features that can be mixed and matched to address the specific needs of your patient. Since all Stride components are modular, you can quickly and easily change components and function within the same orthosis. The Stride4 is the latest addition to the Stride Family of interchangeable stance control knee joints. It contains many additional features to enhance patient function and like the FullStride and SafetyStride, the Stride4 is a mechanical stance control orthotic knee joint that utilizes a low-profile cabling system to automatically unlock at the end of stance phase. At the end of swing phase, when the orthotic knee joint reaches full extension, the locking mechanism re-engages to provide knee stability for stance phase. Cable adjustment clevises allow the practitioner to easily adjust the cable length to match the patient’s stride length. The joint body of the Stride4 is comprised of a four bar linkage mechanism; the upper and lower aspects of the joint do not purely rotate about one fixed center of rotation. Instead, the joint motion involves some translation, in addition to rotation, to more closely mimic anatomical knee motion. In the stance control mode of operation, the four bar linkage mechanism provides stability when the orthotic knee joint is fully extended. An integral extension assist spring housed within the midsection assists with knee extension, while an adjustable extension stop allows the practitioner to adjust and fine tune the point at which the joint enters into its stable/locked state. If desired, the extension stop can be fully adjusted to eliminate the stability feature to facilitate free motion. A button on the Stride4 allows the patient to switch between locked and stance control modes of operation. This feature provides the patient with the option of locking the joint should they desire. When the lock option is selected and engaged by the patient, the joint will allow approximately 3 degrees of flexion to provide some shock absorption to the user. He has near normal ROM in all joints B/L. His right knee and left hip are weaker. He has at least fair strength throughout, with weaker plantar flexors than dorsiflexors and weaker hamstrings than quads. • Manual muscle evaluation: right knee and left hip are weak. Plantar flexor weaker than dorsiflexors. • The patient states that he wants to attend his children’s activities without embarrassing his family by appearing drunk. To view the difference in the patient walking with and without the KAFO, visit http://www.youtube.com/watch?v=nkO7XyWTCzY. Michael J. Mueller PT, PhD, FAPTA, is Division Director of Research in Physical Therapy, Professor of Physical Therapy and Professor of Radiology at Washington University School of Medicine in St. Louis. He is a member of the American Physical Therapy Association, American Diabetes Association and on the Board of Trustees, Foundation for Physical Therapy. He has been an active researcher since receiving his PhD in 1992 and is known for his work on the Physical Stress Theory, which has broad applications to physical therapy, and his research related to diabetes and peripheral neuropathy. 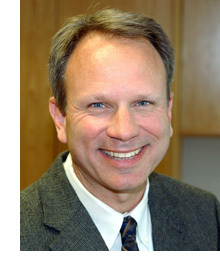 Dr. Mueller is one of the profession’s most prolific researchers, having published over 85 peer reviewed articles. In addition, he has received millions of dollars in federal grant money to support his research and trained a number of successful scientists in the field. Dr. Mueller has been a tireless supporter of physical therapy research and currently serves on the Board of Trustees for the Foundation for Physical Therapy. During this time, he has contributed to and promoted the science of rehabilitation on a national and international stage. LeMaster J, Mueller MJ, Reiber GE, Mehr DR, Madsen RW, Conn VS. Effect of Weight Bearing Activity on Foot Ulcer Incidence in People with Diabetic Peripheral Neuropathy: The Feet First Randomized Controlled Trial. Physical Therapy; 2008; 88:1385-1398. Mueller MJ, Zou D, Lott DJ. “Pressure Gradient” as an indicator of plantar skin injury. Diabetes Care. 2005;28:2908-2912. Maluf KS, Mueller MJ, Strube MJ, Engsberg JR, Johnson JE. Tendon Achilles lengthening for the treatment of neuropathic ulcers causes a temporary reduction in forefoot pressures associated with changes in plantar flexor power rather than ankle motion during gait. Journal of Biomechanics. 2004;37:897-906. Mueller MJ, Hastings M, Commean PK, Smith KE, Pilgram TK, Robertson D, Johnson JE. Forefoot structural predictors of plantar pressures during walking in people with diabetes and peripheral neuropathy. Journal of Biomechanics. 2003;36:1009-1017. Mueller MJ, Sinacore DR, Hastings MK, Strube MJ, Johnson JE. Effect of Achilles Tendon Lengthening on Neuropathic Plantar Ulcers: A Randomized Trial. Journal of Bone and Joint Surgery. 2003;85-A(8):1436-1445. Mueller MJ, Diamond JE, Sinacore DR, Delitto A, Blair VP, Drury DA, Rose SJ. Total Contact Casting in the Treatment of Diabetic Plantar Ulcers: A Controlled Clinical Trial. Diabetes Care. 1989;12:304-388. Under growing pressure from hospitals and physicians, the CMS is delaying the “two midnight” rule until after Sept. 30, 2014. The rule, initially set to go into effect, March 31, is intended to reduce costly hospital admissions in cases better suited to outpatient treatment. The rule stipulates that auditors can assume that an admission is reasonable and necessary if the patient spent two days as an inpatient, defined as spending two midnights in a hospital bed. APTA's NEXT Conference and Exposition, June 11-14, Charlotte Convention Center, Charlotte, N.C. Please feel free to submit your questions on the Becker Orthopedic Stance Control KAFO as well as any other issue you would like addressed.